Wednesday August 15, 2018 - A section of Western Kenya leaders have demanded that the report on the contraband sugar scandal be reintroduced back to Parliament. This is after it was shot down last week with claims that money exchanged hands. Speaking during a Press Conference in Parliament, Luhya MPs criticised an earlier proposal by three of their counterparts to have the President form a commission of inquiry. 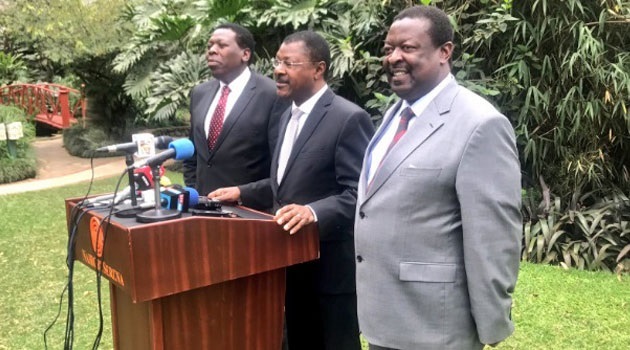 “Mudavadi, Wetangula and Wamalwa are our elder brothers and we listen to them but there are many ways to do this and we here in Parliament are in agreement that reintroducing the report is the way to help our farmers,” the MPs said. This comes even as Devolution CS, Eugene Wamalwa, Ford Kenya party leader, Moses Wetangula, and his ANC counterpart, Musalia Mudavadi, held a private meeting over the issue and called on the President to form a commission of inquiry to look into the matter. “We have recorded our disapproval of the despicable behaviour in the National Assembly and collectively agreed to engage various players in the sector,” Wetangula said.